Ananda Devi in conversation with Thomas C. Spear. From the « Literary Talks Series » of the FIAF. In English. Recorded at the French Institute / Alliance Française (FIAF) of New York. 18 March 2009. 82 minutes. Page de présentation d’Ananda Devi. 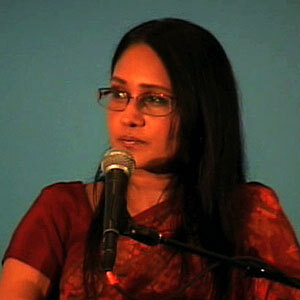 00:00 – Introduction by Lili Chopra, Program Director, FIAF. 02:15 – (Thomas C. Spear): What is the place of Mauritius in « Francophonie, » or French-speaking world? During the year of « Francofffonies » in France (2006), you were on a program with more vocal, animated writers (Calixthe Beyala, Daniel Maximin, Alain Mabanckou, Tierno Monénembo). Are you more « calm » (personally, nationally), because of 100 years of English colonization (as well as French), than for other ex-colonial writers/countries? (Ananda Devi): Language is not a « flag » to fight for or with. Mauritius, the only country in the world where English is losing ground to French! More interpenetration of French culture with local culture during colonial rule than with English (newspapers, for example). Until opening of Suez canal, Mauritius was key supply point of the Indian Ocean between Europe and Asia (reason for French and English fighting over Mauritius and Réunion). British colonizers more « aloof, » language of official purposes rather than for daily use, where French remained, with universal Creole. Mauritian Creole is French-derived, English is often a third language for Mauritians. Using French as a child, there was no fight with language that some writers have. I began writing in a « state of innocence » regarding language and the act of writing itself. 11:00 – English may be common in Mauritius for business and government, French for newspapers and literature, and there are so many other languages spoken and written (Hindi, Urdu, Hakka and Bhojpuri). Your « mother tongue » is Telugu, and your « native » language is Creole. What is your attitude toward Creole, that is not taught in the schools as are French and English? AD: Yes, mother’s language (of South Indian grandparents and ancestors) was Telugu, spoken to her children. Our parents spoke Creole, and as children we heard Bhojpuri and learned French and English in school. Returning from school, would respond to parents in French who eventually spoke French with children at home. Mother tongue was « lost, » realized when mother died. Uneasiness with the idea of « mother tongue. » Writing an article recently, remembered a sentence in Telugu by mother, « go and fetch the pen, Renu. » So have, in a sense, obeyed mother in fetching the pen! Writing is a state of tension, to pull something from language. Many Francophone writers have a strange relationship with the language, to try to pull language into a direction that is their own. For example, Michel Houellebecq, a French writer, tries to avoid style; perhaps because he has no issues with the language distracting him from what he wants to say. Whereas I want to use the language in my own way, and create my own music with the language. 18:30 – You have written scientific articles in English (as an ethnographer) and write fiction in French. Is there a difference for you between these two languages, specifically? Studied in French and English. Went to university in England. Perhaps different parts of the brain for academic and literary writing. Poetry or prose writer? A poetic prose, with music of prose creating images and that occurs in French, and is often re-created when in English. French seems to come from the heart, from the immediacy of creation. Perhaps because French is closer to Creole. Perhaps chance or coincidence. 23:30 – You were one of the signatories of the « Manifesto » of 44 writers published in Le Monde in 2007, « Pour une ‘littérature-monde’ en français. » As a Mauritian writer, having published there and with different publishers, do you find a real potential for exchange of works in the French-speaking world? Perception of non-European writers to feel as second-class citizens in France. One year [in 2006], for the Parisian book fair, writers of « Francophonie » were invited, but none from France! The manifesto was intended to address the French, Parisian or even the Saint-Germain-des-Prés literary establishment, for them to look at authors and their writing (form, content, style) without geographic distinctions. Signed the manifesto because reception of my works are not the same as for French writers. African, and French-African writers, are categorized as African, but authors such as Le Clézio, who has Mauritian origins, as French. Writers should not be categorized by their national identities. The manifesto had much impact, perhaps because of the way it criticized the official organization of Francophonie, whose leader Abdou Diouf responded to the manifesto. 32:00 – When writing, is it the character, such as Ève or Joséphin, that appears to you first and begins the writing process? or is it the thematic problem? It depends on the book. For Ève de ses décombres, the words of the title came to me for which I wanted to write a poem, which would be long, then the question of the rubble, the décombres. It’s not a sentence, something is lacking in « Ève de ses décombres »: who is this girl, what is this rubble she’s coming out of, or from? In Soupir, inspired by a newspaper article about the village of Soupir in Rodrigue island; the question of what one would feel, coming from the town of « soupir » or « sigh. » For Joséphin, it’s a very short novel that took some 20 years to come to fruition. When ill, I heard the voice of Joséphin and wrote the stream of the novel in a feverish state. 37:05 – Your husband (Harrikrisna Ananden) has transformed Ève de ses décombres for screen, and created a film version of your short story « The Cathedral » (La Cathédrale). How has it been to change medium for these stories, working with him on the screenplays? They are very different projects. I wrote the short story « La Cathédrale » when I was 17, before I met my husband who liked the story and said, if ever he made a fiction film, he’d like to film that story. After many years of filming documentaries, he came back to this idea. It was very distant from me, some 30 years after writing the story, and one of my few stories that is not completely dark, and has some hope! The film does have hope and light, unlike most of what I write. Ève de ses décombres is a much more recent text. Writing the screenplay, we got into very intense creative arguments, seeing things differently. For a screenplay, you need to let go of the poetry of language. Shooting The Cathedral was endless, with long days of shooting. When you write, you are alone with the creative process. During the filming, I would escape into the cathedral of Port-Louis to get away from all the people involved with the filming. I have images in my mind as to what Ève looked like, which was difficult with casting, but I needed to relinquish the work and let it become something else. It’s no longer my « baby, » the film is his project that I am collaborating with. 43:30 – You’ve written many short stories, as with those published in the annual Collection Maurice series edited by Barlen Pyamootoo. Does a story naturally come to you as a long or short prose narrative? The longer form now seems more what I want to do, and nowadays I only write short stories for commissioned pieces. When I began writing, the discovery of the short story form was a way to learn a writing technique. For a literary competition organized by the ORTF, short stories were read on the radio, and I started writing short stories for this competition. My longer texts do not have many characters, but often a focus on a single character and a single narrative line. It may be similar to a short story, but secondary characters and the plot pull you in different, often unexpected directions. With Pagli, it happened with the place name. French, English and Hindi place names in Mauritius have such interesting meanings, and such place names are important in my writing. I saw the novel take place in « Terre rouge, » I saw the end of the novel. Le sari vert is unusual with the central male character. The title (The Green Sari) may indicate softness, but it’s a novel narrated by a very violent person. 50:30 – The violence of your works, psychological traumas, what Catherine Colleu referred to as your « apnée, » and « entre-deux, » an almost oppressive reality, complex sexual traumas. Is this your natural disposition?! I have a dark outlook on the world which comes out in my writing. When I won the prize for « La Cathédrale, » it was read on the radio. The whole family sat around the radio to listen, and I saw my parents, shocked to listen to this sad, tragic and violent story. They saw me differently than my writing. Perhaps there are two different people, the fearless writer and the calm person who has evacuated violence through writing. In Rodrigue, people are very welcoming. When I wrote Soupir, which takes place there, Édouard Maunick – who generally likes what I write – said that Rodrigue is not like that, but is peaceful, calm, and not murderers. Sometime later, I saw a newspaper headline, « Meurtre à Soupir, » that perhaps confirmed that it’s not so peaceful as that. 55:20 – With texts such as Ève and Indian Tango, you’ve taken on spaces of sexual transgression that does not always make readers, especially male readers, comfortable. Joséphin le fou made both male and female readers uncomfortable. Transgression has always been present in my works. When I began writing in the 1970s, there were few Mauritians writing about real social issues, there were more historical novels or poetry. Rue la Poudrière, my first novel, is about a prostitute in the capital, Port-Louis. Writing in the first-person, many readers were most uncomfortable. It was published in Abidjan, and for a long time was not available in Mauritius where people thought it wasn’t appropriate. A writer does not write to attract tourists. Taboo issues such as sexual transgression exist. With Indian Tango, a woman approaching menopause has a sexual awakening, which is transgressive. But Mauritius has become more liberal, with fewer taboos, so I chose to set the novel in Delhi, in India, especially with older generations somewhat set in their ways. Two to tango… La musique s’étire vers elle, touche une chose noueuse dans son ventre, se répand en frisottis au creux de son abdomen. Les notes basses se hasardent plus bas. Les notes hautes font sourire tout le haut. Elle bouge malgré elle en réponse à tous ces vacillements. Là où plus personne n’ose s’aventurer, c’est là que la musique veut aller. […] Il s’ensuit un relâchement de tout son corps, une espèce d’abandon nerveux. Ce tango argentin qu’elle ne reconnaît pas fait enfin bouger une chair quaisiment anesthésiée. Écoutant les pas qui martèlent le sol, en bas, elle découvre qu’elle a vécu, elle, tout ce temps, sans rythme. Elle était flottante, poussée d’un endroit à l’autre, d’un jour à l’autre, sans le moindre effort de volonté. Tout ce qui en est sorti est la certitude parfaite du chemin. Mais cette musique parle, au contraire, de voies détournées, de rencontres buissonnières, de nuits passées à mourir en s’abandonnant à ses rêves pour mieux revivre dans d’autres élans et d’autres abandons. Face à tant de douce élasticité, la raideur des compromis lui semble impossible : les rituels, les devoirs, les habitudes, l’étroitesse des bonheurs. […] Quelqu’un [chante] « kya khabar ? » – quelles nouvelles ? – et elle ne sait quoi répondre. La ville a adopté le même rythme hasardeux. 64:50 – Influences from other writers? Themes may be violent, but poetic language may soften the blow, attracting the reader into the flow of language. Influences? I love many writers, such as Toni Morrison, J.M. Coetzee, J.-M. G. Le Clézio (for Le Désert, and La Quarantaine), and Albert Cohen (Belle du Seigneur). They are nonetheless not necessarily influences, but writers whose works I read regularly. 68:00 – With the power and fluidity of your words, your musicality, these chemins transitionnels, rêver est plus important que le rêve. How do you survive this writing? You reach an « état limite« . It’s a mystery. As with the writer of Indian Tango who asks why writers are attracted to the dark side of people, to violence. Is it an attraction to the dark? to violence itself? One could ask oneself why one wants to go there? As Coetzee asks, what are the writer’s limits? I don’t have an answer, but often the subject will pull me into this hurt, and – as I often write in the first person – deeply into to this feeling. The pleasure of writing itself, and the poetry of language, helps pull you through the tunnel, compensates for the darkness. 74:00 – Your relation to Creole, is it similar to what Chamoiseau writes in Chemin d’école, in that Creole is more a language of orality, and French learned only through the denigration of Creole and for written works? And, having translated The Counting House by the Guyanese writer, David Dabydeen, into French, what was that experience like for you to translate his Guyanese English and Creole into French? In Mauritius, many people still believe Creole is not a language of writing or reading. Creole is one of my languages, and is not in a hierarchical order above or below English or French. Writing in French is ingrained in me, yet from time to time I find the need to write in Creole. A few years ago, to celebrate BloomsDay, I was asked to translate some of Joyce’s Finnegan’s Wake into Mauritian Creole. Perhaps the first time Molly Blooms’s voice was heard in Creole! It was a real challenge. Pidgin English can be understood by an English reader: so it was necessary to translate with French words and a Creole structure. 78:55 – How do you go about « transvesting » yourself to give identity to male characters in your novels? Saying that there are two people, the writer and the person here before you, I think the writer adopts the identity of the characters, the « I. » It is necessary to find this voice within oneself. Perhaps this is why there are more female than male narrators in my novels, but Le sari vert includes this horrible male narrator, and it was fun to write from this mind-set, to write against women from a male chauvinist perspective! The pleasure of writing is that you can become anyone you want, including someone who is diametrically opposed to you. Ananda Devi. Literary Talks Series. In conversation with Thomas C. Spear. French Institute / Alliance Française of New York (2009). 82 minutes. Île en île. 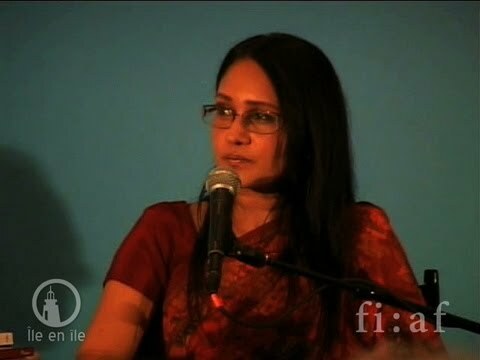 Vidéo également disponible sur Dailymotion (mise en ligne le 20 décembre 2012) : Ananda Devi – Literary Talks Series. French Institute Alliance Française of New York.